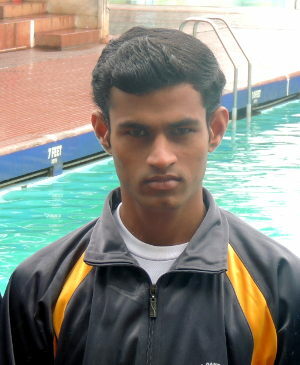 Well known Deaf and Dumb Swimmer of Swimmers Club Belgaum and Aquarius Swim Club Belgaum has been selected in the Indian contingent to represent India for the 22nd Summer Deaflympics which will be held between 26th July 2013 to 2nd August 2013 at Sofia, Bulgaria. He will participate in 50, 100 and 200 mtrs. Breast Stroke events. Umesh is undergoing his swimming camp at Talkotara Swimming Pool, New Delhi from 10th July 2013. This Swimming Camp is being organized by Sports Authority of India. The Indian Team will fly to Bulgaria from Indira Gandhi International Airport, New Delhi on 24th July 2013 early morning. Master Umesh has so far won 24 National Medals comprising of10 Gold Medals, 4 Silver Medals and 10 Bronze Medals at the National Swimming Championship for the Deaf and Dumb held at different places. He is a National record holder in the all the 50, 100 and 200 Breast Stroke event from past two years. He joined swimming in the year 2004 in a swimming coaching camp conducted for the Differently Abled organised by Swimmers Club Belgaum and Aquarius Swim Club Belgaum through Ajay Deaf and Dumb School. He hails from agriculture family from Ankali ( 2 k.m. from Sankeshwar). He also has elder sister Sumitra who is also Deaf and Dumb and younger brother Shekhar. At present Umesh is working at Rotary Corporation Sports Academy’s Swimming Pool and stays in a small room provided by the them. He takes his food in a mess at Bhagya Nagar Belgaum. Mr. Umesh is also a member of Belgaum District Deaf and Dumb Association and he is practicing under the watchful eyes of Swimming Coaches Umesh Kalghatgi, S.R. Sindia, Sudhir Kusane, Prasad Tendolkar, Anand Patil, Ajinkya Mendke, Akshay Sheregar and Kallappa Patil. Umesh is a sincere and dedicated swimmer and getting sports scholarship from Polyhydron Foundation, Belgaum and he is highly supported by Rtn. Avinash Potdar, Ms Maneck Kapadia, Mrs. Lata Kittur, Rtn. Basavraj Vibhuti, Mr. Madhukar Bagewadi, Mr. Pradeep Javoor, Mr. Suryakant Hindalgekar and others. All the best Umesh ! !..